Setting up your Showroom allows your customers to view your products online. Your Showroom is your online marketing and ordering tool for your online retail or eCommerce store. This page will guide you through setting up and previewing your Showroom. It assumes you already have a season containing at least one product to list on your Showroom. 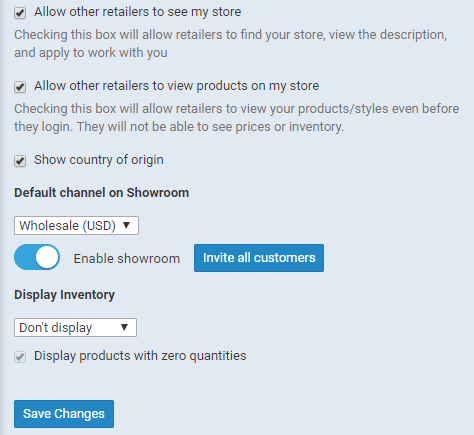 Navigate to your general Showroom configuration page by clicking on the plus sign (+) next to Showroom on the leftmost vertical menu. From the pop up menu, select "Configuration" (Figure 1). On the Showroom Configuration screen, you will be presented with an opportunity to customize your Buyer's shopping experience. The top portion of the configuration screen relate to your URL, brand name and logos (Figure 2). You will want to upload a brand logo for your store as this is the first thing your Buyers (and potential Buyers) will see when they access your Showroom. The logo represents your brand. The image uploaded will be resized to fit in a 4:3 (portrait) ratio space. You can preview how your logo looks before saving your settings to your live store. (See "Enable" And "Disable" Showroom below). Enter the name of you brand as it should appear in your Showroom. By default, Stitchex will use your company name as set in your general settings. The Store brand name will be displayed beside your logo. If you do not already have an online presence for your retail or wholesale site, you can create a URL here. Your Stitchex URL will be https://buyer.stitchex.com/ plus whatever you put into this field. If you do not specify anything in this field, you (and your Buyers) will need to browse for and select your Store from a list of all other Stitchex stores. As such, we recommend you type something in this field. As an example, if you type "Boutique", then your URL will be https://buyer.stitchex.com/boutique. https://buyer.stitchex.com/buyer/organisations/####/preview when you navigate to it. Add a "CNAME" record with a "host" called "buyer.stitchex.com" to your DNS table. If you do not know how to add a CNAME record to your website, contact your Internet Service Provider directly. Your ISP will list the URL as showroom.stitchex.com. Allow 24 hours for your new domain host's DNS settings to take effect. Then type the custom domain name you want in the Custom Domain field below as shown in Figure 2. 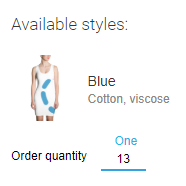 Add a description for your Store. The description will provide additional information for your Buyers about what type of products you sell. It is the "opening statement" that will entice them to visit your store. If you sell formal wear as an example and they are looking for formal wear, your description will confirm for them that this is the Store that may help them find what they are looking for (Figure 3). The description will be displayed on your Store at the top left near your logo and brand. The last section contains detailed configurations that control what your customers see, how your pricing will be displayed and how your inventory will be displayed. (Figure 4). The "Allow Other Retailers" settings determine whether you want other buyers to see your products even without signing in or applying to your brand. They will only be able to view the products. They will not be able to see pricing, inventory or place orders. Specify which pricing Channel you want your customers to see. See our Knowledge Article for more information on Channels. Enable your Showroom when you are ready to enable access to your store for customers. Disable Showroom to temporarily disable access to your Showroom so that you may test/preview any recent changes/updates before publishing to your customers. Disabled: Customers cannot view your store while you are working with it. Only you can see it when you go to your store's URL. Enabled: Customers can view your store. Stitchex allows you to control what products are displayed on your Showroom. 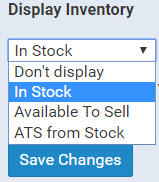 Your options are "In Stock", "Available to Sell", "ATS from Stock" and "Don't Display". If you select "Don't Display", Stitchex will not display the number of products you have in stock or available to sell. However, if the Buyer attempts to order more than what is in inventory or available to sell, their quantity entered will automatically be reduced to what is in stock. 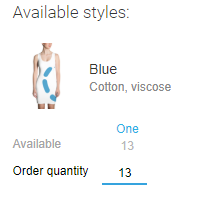 If you select any of the other options, the "In Stock" or "Available to Sell" quantities will be displayed directly above the quantity on the Buyers' page. When you click on the Invite All Customers button, an invitation will be sent to all Wholesale customers only. Do not click this button until you are ready to send the invitations! This means you will want to Preview your Showroom before sending invitations. 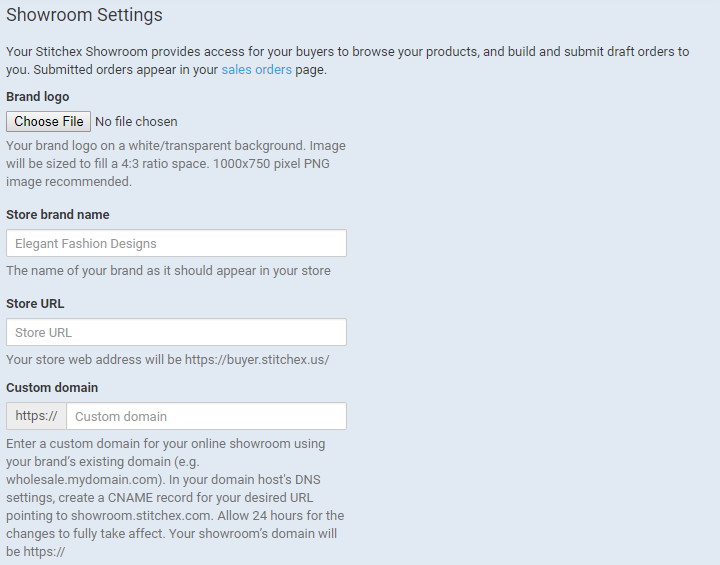 While your Showroom is "Disabled", you can preview the store by going to your Showroom's URL. What you will see is the "public view" of what non-logged in buyer's can see. If you do not see any products, you may not have any Season's set to be displayed in your Showroom. Please see our Knowledge Article on Managing Seasons. If you want to see what logged in user's see, you will need to set yourself up as a Buyer so that you can login. See Next Steps below for more information. Follow the instructions in Managing Showroom products to add your first collection of products to your Showroom.